Foreign Affairs Secretary Teodoro “Teddyboy” Locsin Jr. has slammed his predecessor, Alan Peter Cayetano, and other Cabinet officials over their alleged failure to help him reach President Rodrigo Duterte during his stint as Philippine Ambassador to the United Nations. 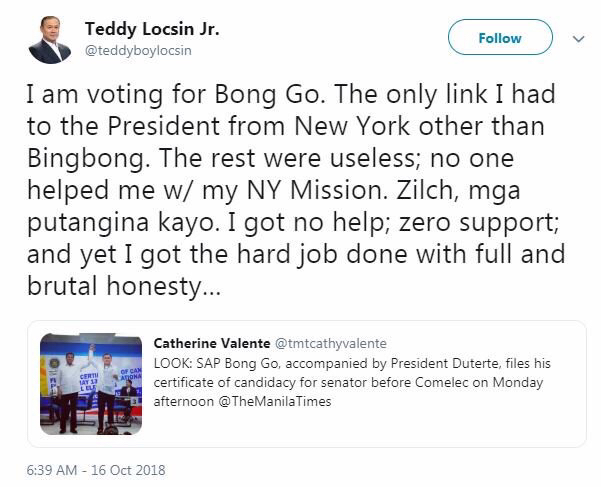 In a tweet posted Tuesday (October 17), Locsin said only former Special Assistant to the President Christopher “Bong” Go helped him talk to Duterte when he was working in New York. Go’s assistance was the reason why Locsin supports his senatorial bid. “I am voting for Bong Go. The only link I had to the President from New York other than Bingbong,” Locsin tweeted, referring to Executive Secretary Salvador Medialdea. “The rest were useless; no one helped me with my NY Mission. Zilch, mga putangina kayo,” he added. Locsin said he didn’t get support from Cayetano and other officials for his job. “I got no help; zero support; and yet I got the hard job done with full and brutal honesty,” he said. In response to netizen sallydagirl1, Locsin clarified that Go didn’t help him in any other capacity aside from letting his messages reach Duterte.